There is a place so dark, raw and empty that it is most profoundly hard to pray. You may have a concept of God in years past. You may wish you had one. And yet all you feel is the darkness. The loss. The emptiness. The terror. This is a prayer, written as a story/poem of sorts, humbly offered for this time. We come before you with empty hands, broken hearts, tear-stained faces, bodies weak with fatigue. Our minds have raced for so long, and now we feel lost. We offer this prayer filled with unknowing. Unknowing of your existence. Unknowing of hope. Unknowing of how we will go on. Our insides are destroyed. The worst has happened or is imminent. We thrash around. How can this be? Why did this happen? Is there not another path that could have opened? We cry. We collapse. There is no comfort here. No words can change this reality. And yet we are still here, God. We are here with our broken hearts and our helplessness and our hopelessness. What can we do? What prayer can we say? Why even bother? Someone says, "There is a reason." We shout, swear, throw over a chair, break dishes. Someone says, "There is always hope." 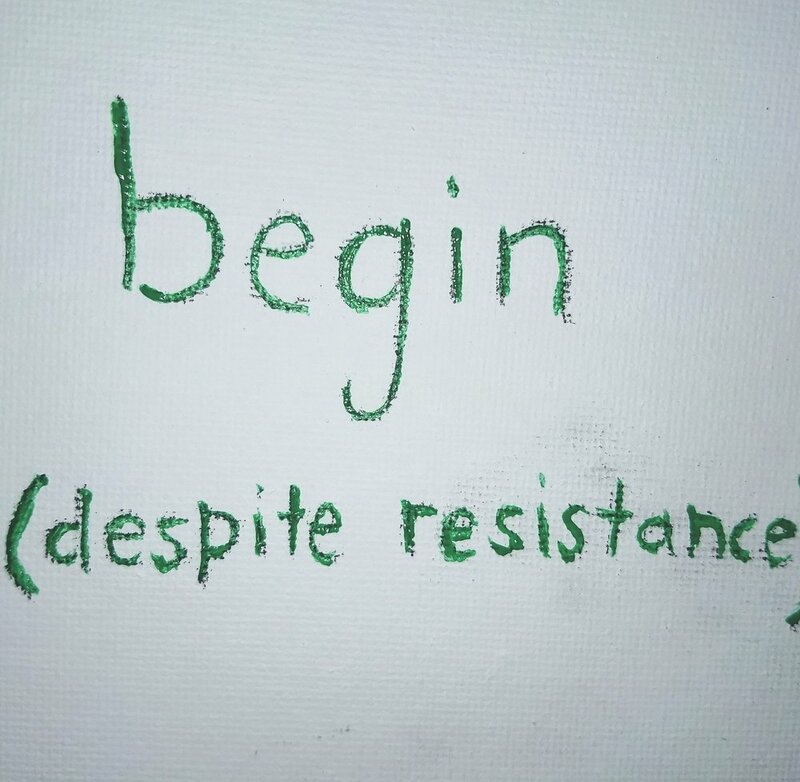 A bitterness rises in our mouth. We want to be sick. They don't know. How do we find a prayer of hope here? The damage is done. The worst has come to pass. Finally fatigued with our thrashing, our anger, our tears. We lie down. Collapse. On the cold hard floor of this harsh reality. We lie there for hours. Hours that stretch to days and weeks. Perhaps our bodies rise, going through motions, and yet our spirit stays on that cold hard floor. Can you reach us here God? Can you come to us? God of beauty and music, sunset and flowers, what do you have to do with this kind of pain? This kind of loss? This unrelenting pain and fear? You lie down on the cold floor next to me? You pull a blanket around me. I feel the hardness still below me. Your hand is on my shoulder. An unexpected warmth moves over my skin. There is a sound. I haven't heard it before. It is a deep vibration. It carries my heartache. It doesn't stop it. It moves with it. It is not the shush for a crying baby. I realize this is the groan of a laboring mother. A deep, soul-rocking sound. A long time I lay here, this warmth enveloping me. This sound carrying me. Have I fallen asleep? Am I waking up? Something shifts in me. This pain. Is it possible it won't kill me? Is this pain something different? There is something new about it. Is the guttural sound of my heartaching--a laboring? the sound of breaking open? It is all I can do. I breathe. I realize something new is arriving within me. What new fragileness could be born of this experience that has torn me in half? Asking this question I feel uncomfortable. I notice my arms and legs. Having been bent over in grief for so long. Clutching my stomach. I forgot they were there. I didn't know this might move through me. When all I felt was darkness. I didn't know that light would pour through this wound, surrounding me. May the impossible pain and loss of this situation miraculously be filled with light. May I somehow, far beyond my comprehension, find a way to let this not just be death and loss. May it be a way for light to stream in, through and around me. May the heaviness I feel be lifted as I look around and remember your loving presence. May I remember how you lay with me, midwifing this loss with me. How I was never alone. May I find strength and courage with time to be with others who know this unbearable pain. May I never offer saccharin comforts of a certainty that does not exist. May my intimate knowledge of this despair keep me remembering the fragileness of every moment. May I surrender control and yet not release my ability to be part of love and light that surrounds us all. May I embrace that love and light around me. May I hold tenderly this experience that I thought would destroy me. May I proceed gently, as my wounds are raw. May I awaken to all the love and light surrounding me. This prayer and painting "Finding Light" (36" x 108") I created for Finding Hope 2019. They will be on display at Bryn Athyn College, on April 6th, as we focus on expanding our capacity to be present with one another in hard times. We talk about the impact of suicide, addiction, domestic violence, sexual abuse, and mental illness and show up with support, compassion, and resources. You can find more info here. All are warmly welcome to attend. Photos Include some of the creative process, including the Finding Hope team writing prayers on the canvases before I painted. 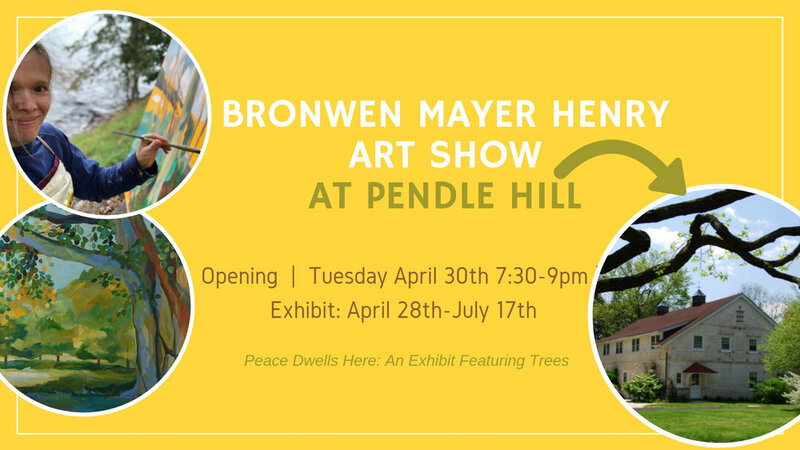 I am so excited and grateful to have made a connection at Pendle Hill...and when they said they were looking for an artist to feature trees and spirituality--it felt like a perfect fit. If you've ever wanted to check out Pendle Hill--the gorgeous restorative quaker retreat--now is your chance! Will the surgery be successful? What does the diagnosis mean? Will this relationship heal and grow or is it the end? Will I get the job? Will I get into the school? Will my loved one stay clean? Will we be able to get pregnant? Will the adoption go through? Will I stay in remission? Will I have the strength to get through this challenging time? Will we be able to pay our bills? And on and on. Here is a prayer for the times of life filled with uncertainty. When life feels overwhelmingly insecure. If possible, stand with (bare) feet flat on the ground for this prayer. If seated or lying down, feel the surface holding you. When everything seems to be swirling and moving, may we feel the earth solidly beneath us. When fear and anxiety threaten to overwhelm us, may we return to this moment and notice the breath. In, out. In, out. When our mind races ahead to what if this and what if that, may we remember the seasons, gently transitioning without any of our help or involvement. May we remember we are part of this creation. Gently transitioning through seasons as well. When the chatter of the unknown won't let us rest. May we get quiet. May we notice the sounds around us. The birds singing, the children playing, the rhythm of traffic moving. May we hear our heart beating and our breath rising. May we be still and welcome in Your love and let Your love comfort the part of us that is so agitated. May we lean into the wisdom of the soul-level, the whisper from You that even though so much is unknown, we are known, we are loved, and we can offer that love as we walk through this time. This winter painting is created with a longing to remember the beauty present in times of uncertainty. The longing to remember the light that shines in dark, wintry times. The longing to be immersed in the beauty of this moment. With the sun streaming in, I paint this morning with a full heart. I feel wrapped in gratitude for so many aspects of being alive. Painting helps me to narrow in on the simple joy of the movement of paint on canvas, and painting helps me to expand outward to gratitude for the the roof over my head, the loving people in my life, and the way the sun rises each day. As I immerse myself in this restorative environment, I have in mind this morning people who are overwhelmed. Sometimes it feels like everything comes at once. Right at the moment you get the best news ever, someone you love is in hospital. Right when you decide to dedicate yourself to a new goal, your child needs you urgently. Right when you think you can't take any more, something else comes up and you search in your reserves for how to get through. This prayer is for anyone in that place. That place where your own health, the health of people you care about, your job, your partner's job, your child, your grandchild, your parent, need extra care and attention...AND your dog is barking...AND dinner just burned...AND you get a flat tire. This is a prayer for these moments. Thank you for this life. It feels messy and overwhelming. And still being here, help us to remember to see it as a gift. God, we thought yesterday was hard enough and today we find even more challenging. Help us to release the question of 'why?' or 'why now?' or 'why me?'. Help us to ask instead, "How can I step into love? How can I see and feel and share love, even in this very moment?" Help us to surrender to your love. To take a break from solving. Help us to be brave. Give us energy to keep going. Help us to rest. Help us to accept the care that is offered to us. When everything seems to be too much, may we remember to breathe. May we pause and recall the gentle warm breeze of summer. May we remember the flow of seasons. May we remember the stars shining in the night sky. May we remember the intensity of storms and then the quietness of the morning. In all of this, may we remember you, Your gentle presence guiding us and leading us always even when it doesn't feel like it. May we discover courage where we feel fear. May we find hope where we feel despair. May we step into rest where we feel restless. Hold our hand, walk with us in the parts that must keep moving on...and guide us to rest in the parts that we can let go of. Amen. Three elephant paintings newly on display at @bewellbakery ! Check them out while you grab a delicious meal, dessert or drink. Though I often paint alone and find the solitude a balm, I have also witnessed and experienced the transformative power of creativity in community. Similar to doing meditation at temple or yoga at a studio, there is a way in which you stay in the practice longer when surrounded by the energy and accountability of others. The first step I invite participants at Open heart studio to do is to remove the plastic wrapper around the canvas. Stepping into creativity is vulnerable. We must remove a protective layer. Stepping into community is vulnerable. If we want to connect with others, we may think we need to show our perfection, but really we connect around our authenticity and vulnerability. I'm so grateful for the chance to walk with people as they step into creativity, into the curiosity, wonder and delight of the human spirit. What a blast helping sixty...SIXTY women step into creativity last night. If you are looking to step into creativity and think the support of community might help. Check out my upcoming events. Creating a retreat with Martha Nash Pitcairn, founder of Ignition Academy was a dream. The fact that eleven women joined us, played along, showed up BIG, tenderhearted, open and loving was a dream come true. Though much of what happened from the weekend is hard to capture in words, here I strive to share some of the joy and insights. I absolutely adored the opportunity to create this space with Martha Nash Pitcairn from Ignition Academy. The trust and confidence we had in each other, the passing back and forth of workshop time, working together was equal parts freeing, empowering, and laughter-inducing. I have a lot to learn from this wise woman, and I’m humbled to serve on a team with her. Most common phrase heard at beginning of the weekend...”I’m not a painter.” or “I’m not creative.” etc. It took close to 50 hours, but participants finally dropped this ‘I’m not creative.” narrative. Now, it wasn’t our goal that participants become painters. Our goal was that they broke through limiting thinking, that they broke through negativity, that they explored the canvas as a safe space to be brave, to take risks, to try something new, and a place to be new. They showed up with brave hearts and as a result transformation happened. On the morning of the second day people were diving into their canvases. As I worked alongside the group I realized I had forgotten to tell them something. I forgot to warn them about the ugly phase. How many paintings have a moment that is raw and uncomfortable and new and well, ugly. And that it is normal and okay to dwell in this space. I’m grateful for the knowledge of the ugly phase and that everyone persevered through this discomfort. There is something profound about being in silence together in community. During the weekend we had five sessions of silent/meditative painting time. There is something about the accountability, the shared showing up that buoys the spirit. The experience is very similar to meditating in a group. You get to be alone and part of the whole at the same time. It was awesome to see people continue to step into the creative space. To show up with deep presence and courage. Breakthroughs creatively and on deeper levels came at unexpected moments. It was an important reminder for me to keep showing up, keep creating the space, keep stepping into it, and be curious and open to what wants to unfold, to trust the process. Throughout the weekend, one person painted a white canvas white. A meditation on emptiness, undoing, letting go. It was an awesome reminder to the rest of the group to not take anything to seriously, to let go, to remember the empty space. A few participants (myself included) chose to paint outdoors (hats and gloves included!). I found the experience to be completely invigorating and led to new energy in my heart and on the canvas. I can hardly wait to get back outside. Something about the wind in my hair, the gentle nature sounds, alongside the movement of paint and color is soul-nurturing. Though we each worked independently on our canvases, there was some invisible way that we were bonded together. We witness each other's paintings come to life and in the end the lessons that were learned individually were shared collectively and there was a deep sense of belonging and understanding. From the first moment people started arriving, there were introductions and hugs. I was blown away by the way everyone showed up for each other in loving community. In a shared space of vulnerability a deep bonding happened. That a deep sense of ease alarms me? But I don't need to figure it out. And so I offer it to you. May you hear the alarm. May you hear the call to wake up. May you hear the call to peace. Find yourself centered and at peace. May you be alarmingly peaceful. It was an amazing experience working on these hydrangeas. 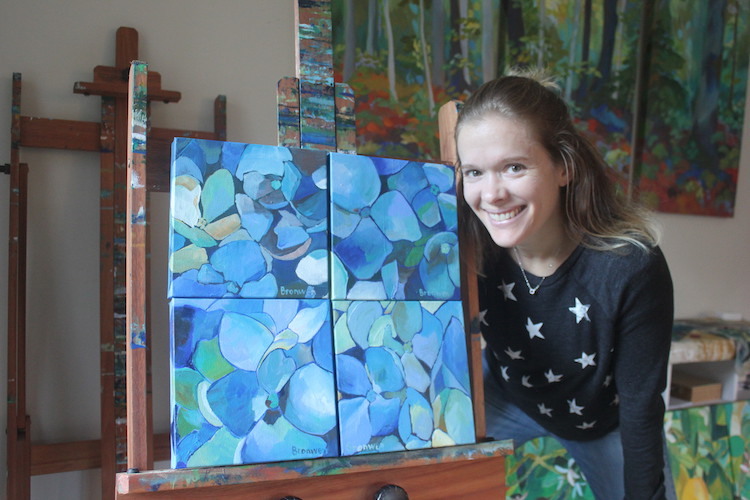 The collector asked me to create a piece featuring blue hydrangeas and gave me the following prayer request, "I think the prayers needed most at this point are prayers for understanding, love and acceptance in our society. These are the things that are ever present in our minds and what we speak with our children about over dinner. We want our children to understand the importance of standing up to hate and bigotry and, instead, spreading love and understanding." This is an incredible statement. One that is incredibly poignant today as ever. I was stunned to receive this inquiry and how it connected to the prayer request around the first blue hydrangeas I ever did. What does it look like to step into love? How do we stand up to hate and bigotry? How do we get along with our neighbor? And what does all this have to do with hydrangeas? I often find the subject matter I'm drawn to (or a collector is drawn to) has a message that is relevant. And sure enough, Hydrangeas are sometimes seen as reminders of gratefulness for understanding. They are often offered at times when forgiveness is needed. They are also signs of deeper understanding growing between two people. Can we forgive our neighbor? Can we offer love and understanding in the face of its apparent absence? I recently heard Rabbi Jonathan Sacks articulate in an interview with Krista Tippet on OnBeing: "God is setting us a big challenge, a really big challenge. We are living so close to difference with such powers of destruction that he's really giving us very little choice. To quote W.H. Auden, 'We must love one another or die.' That is I think where we are today. We really can love one another, I have a great deal of hope." I lean into the wisdom of Rabbi Sacks, his confidence and hope. I lean into the beauty of these hydrangeas reminding us to be pursue understanding and be grateful for its presence. I lean into the possibility that one family's intention to stand up to hate and expand love and understanding can make a difference. I lean into the urgency of Auden's words 'love one another or die.' I lean into the quiet space of creativity and then put down my brush, take off my apron, and try to lean into these words in my life. 8" x 8" Spread Love & Understanding No. 1, No. 2 (SOLD)., No. 3, No. 4 (SOLD) (Numbering is clockwise, starting top left). Check out available pieces here. What if light touched every element of your life...the areas of growth, the calm places, the obstacles and the dreams? This is what I found myself reflecting on as I create this commissioned piece of Glacier National Park in Montana, painting trees, water, mountains and clouds. It all started a few weeks ago when I was taking down my show at Gryphon Cafe, I met someone interested in a custom painting. After a few email exchanges on ideas we settled on a photo he had taken at Glacier National Park in Montana. It was a great deal of fun for me to tackle this new subject matter. I'm super excited about the results! After sending a work in progress pic to the client, I was thrilled to hear back, "This is better than I ever would have imagined! The light/color combination is perfect! So glad you could bring out the color better than the picture and see it the way I did in that moment. Very excited to see it. Thank you!!" I love how commissions challenge and stretch me to explore new themes in my work (remember the oceans just a few months ago?). If you have an idea for a custom piece of art-let's talk. It can be a joyful and collaborative experience. 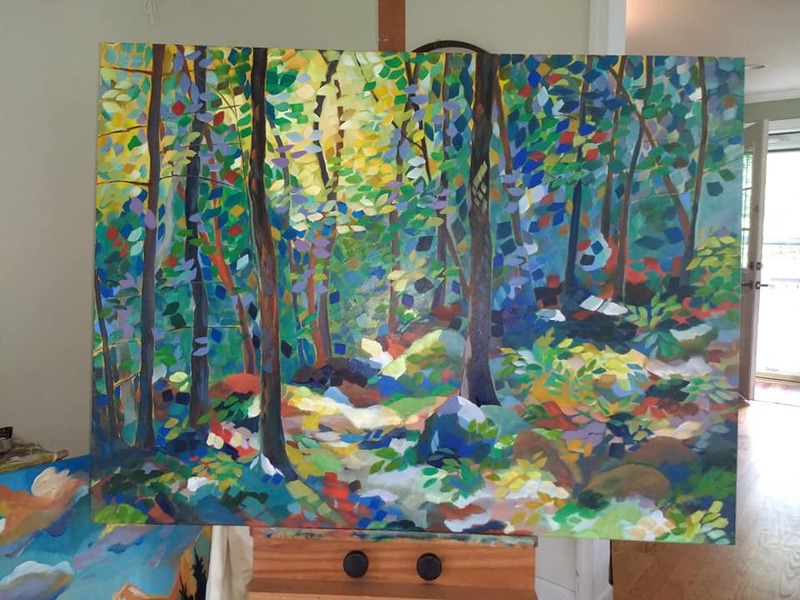 These paintings are inspired by a hike I took in Cape Breton, Nova Scotia. This was one of the most beautiful hikes I've ever taken. What is not pictured is my anxiety. I was hiking with my husband and two children along a riverside that led to the ocean. The trees sheltered us from the sun and occasional shower. The sounds of the river alongside us was glorious. We kept our eye out for (and made noise to avoid) moose and bear (we did see one moose). After 6 kilometers, we settled into one of the most gorgeous oceanside backpacking sites I've ever seen. As I put my backpack down, I felt a heaviness settle in my gut. We were hours from the car, alone, no cell service. What had I been thinking? I felt completely vulnerable. I had backpacked many times in my life before kids. But with kids I realized my vulnerability to a new degree. As the night slowly moved along. I remember that Pema Chodron's monastery, Gampo Abbey was literally 15 kilometers away. I considered what Pema would say to me in this headspace of anxiety I inhabited. I breathed. Just this one breath. I continued this meditation for 6 hours. After a sleepless night, the sun rose and we packed up camp. As we hiked back, each step brought me back closer to my car, closer to community, closer to a sense of safety. Reaching the car I felt relief. And yet, I reflected that whether I'm off the grid 1765 kilometers from home or safe in my bed at home. I am vulnerable. We are all vulnerable. Remembering that vulnerability, remembering the places tha scare us, is a reminder that life is fragile, that we must fully inhabit this very moment, that gratitude for this breathe is all there is. You know vulnerability. You create such beauty in such delicate fragile places. You know our hearts and our longing for certainty. Our longing for comfort. You walk gently with us as we stumble along searching for someway to know that there is tomorrow. When the whole time you've been that soft warm summer breeze reminding us that today, this moment contains it all. May we breathe in knowing beauty, knowing presence, knowing full awareness and wakefulness. May we breathe out letting go of beauty, knowing loss, aware of our uncertainty and unknowing. May we go to the places that scare us and be most gentle there. May we let the warmth of your love, that moves through all spaces, places, and time be a comfort to us. And empower us to comfort others. Amen. I'm soooo excited to announce a brandy-new idea...I'll be co-coordinating a women's painting retreat this fall! It was five years ago that attending an Ignition Academy Workshop with Martha Pitcairn helped me to re-awaken my love for painting and open to compassion at a new level. 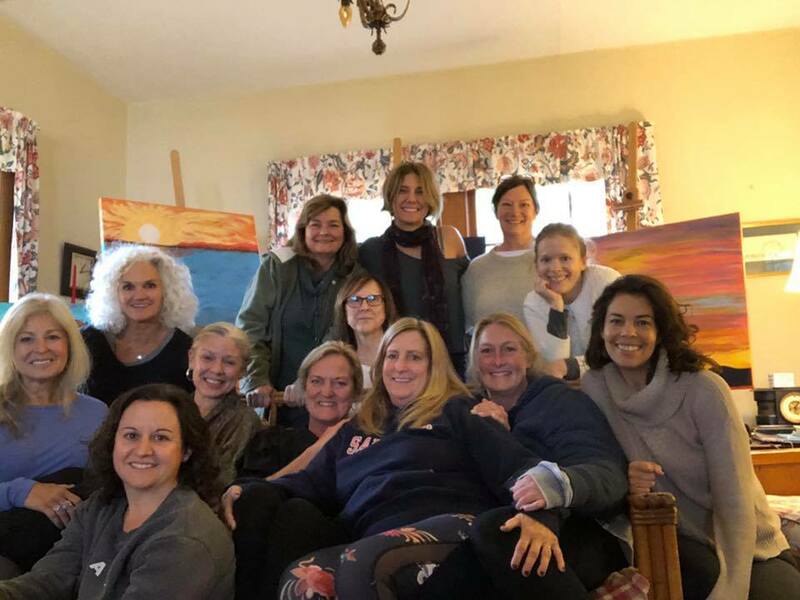 I'm so honored that today, Martha and I are teaming up on a new offering, for the first of its kind Lake Wallenpaupack Creativity and Freedom Retreat on Friday October 19-Sunday October 21. This weekend retreat put on jointly by the two of us will be an exploration of compassion, creativity, kindness, freedom and gentleness all in the context of a beautiful lake house setting in supportive community. Retreat days will be filled with soul-nurturing time, space to breathe, meditative painting sessions (Yes! 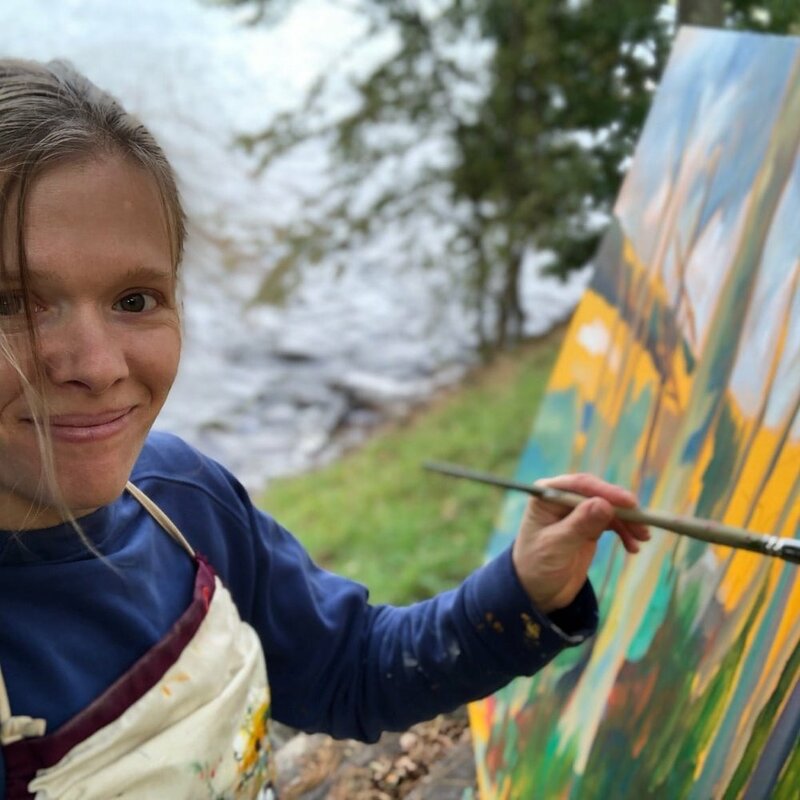 on BIG canvases), coaching sessions, group workshop time, connections with new friends, quiet moments by the lake and delicious healthy food. If you have the itching feeling that you could use more space to breathe, please attend. If you long to stretch and grow more into your own skin, please attend. If you want to explore a creative, spacious, kind part of yourself, please attend. If you want a break from the hard working, perfectionist side of you, please attend. If you aren't sure why and think maybe you are crazy to do so but you want to come, please attend. Spaces Limited. Register Here. Note: There will be time to breathe! The main challenge will be choosing what restorative practice to pursue! Discount: Sign up with a friend, you each save $50 and we'll hold a room for you together. Set along the beautiful Lake Wallenpaupack in Northeastern Pennsylvania, the retreat center is a cozy cottage. Please note access to home and lake by stairs only. Non-refundable payment in full needed by October 1st. Ignition Academy was founded in 2013 by Martha Pitcairn. It is an energizing, non conforming experience of knowing and exploring yourself, surrounding yourself with supportive community and experiencing new environments and situations. Martha is a freedom and breath coach helping people to come alive. What is Open Heart Studio? Open Heart Studio is a space to open to more creativity and kindness. Bronwen Henry has been leading studio sessions over the last year helping people to break through barriers to creativity and kindness. Open Heart Studio is not a painting class, it is meditative creative practice. The canvas wakes me in the morning before the sunrises. It is a pull that I can't resist. This spot has been my studio recently. Quite amazing really. There is something profound about painting the ocean while it moves. Reminding me of impermanence. That whatever I'm feeling whether joy or discomfort is passing into something new. The beauty of the sunrise is fleeting, you can't hold onto it. You just witness it. And let it go. The waves come and go. Each one blending into the other and yet different. 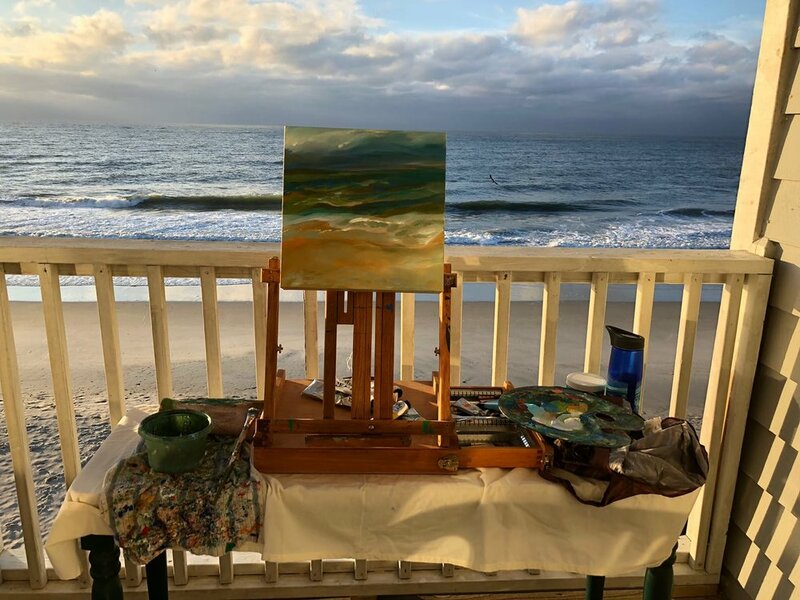 I don't paint this ocean because I'm creating something new or remarkable, but because by painting it something new and remarkable is awakened within me. HOORAY! The Blueberry Collection is now available! Check it out here. This blueberry collection is an ode to the longing of the sweet simple joys of summer. And I'm excited to share them with you. This has been a delightfully focused effort. Giving myself the assignment to focus again and again on this rich subject matter has helped me to step into more joy. I'm thrilled about the names found in this collection, Blue Rhapsody, Pick Me, A Blueberry View, Little Wisdom, Tiny Reminders, and more. Many of these names were submitted from my online community-thank you! Blueberries are a reminder to step into joy, to savor the moment, to open to tiny reminders of hope and possibility. Hoping that your summer is filled with moments of respite, joy, and ultimately wrapped in love. 1. This is my first online collection! Choose and reserve your favorite piece in my online store. 2. Free shipping on this collection (in the continental US)--Oh baby! 3. New sizes! This is my first time offering such a broad variety of sizes...don't have room for a 4' x 4' canvas?--maybe you have room for 6" x 6"? Check out this blueberry collection! This week I'm remembering five years ago. Five years ago I had swallowed a radioactive pill as part of treatment for Thyroid Cancer and was in isolation. Five years ago something opened up in me. Yes, a painting practice (in isolation I created my first large painting). But something else opened up in me. A softness. A compassion. A willingness to see my life with more gentleness. A willingness to see your life with more gentleness. This elephant painting (on the left) is from 2013. Though this elephant is not my first large painting, it is a painting from this first year. I remember creating this elephant and immediately loving it. The novelty that I had done it! I had painted an elephant--it was recognizably so! Looking at it today I see vulnerability and rawness. I named this painting (on the left) "Strength". That is what I was longing for, that is what I was calling into my life. Remembering 2013, I revisited this same canvas size, this same subject matter. It is amazing to see how five years have shaped me. How showing up with compassion and gentleness has formed me. How showing up at the canvas despite my newness, despite fear and doubt, the way I see has shifted. The way I experience life has shifted. 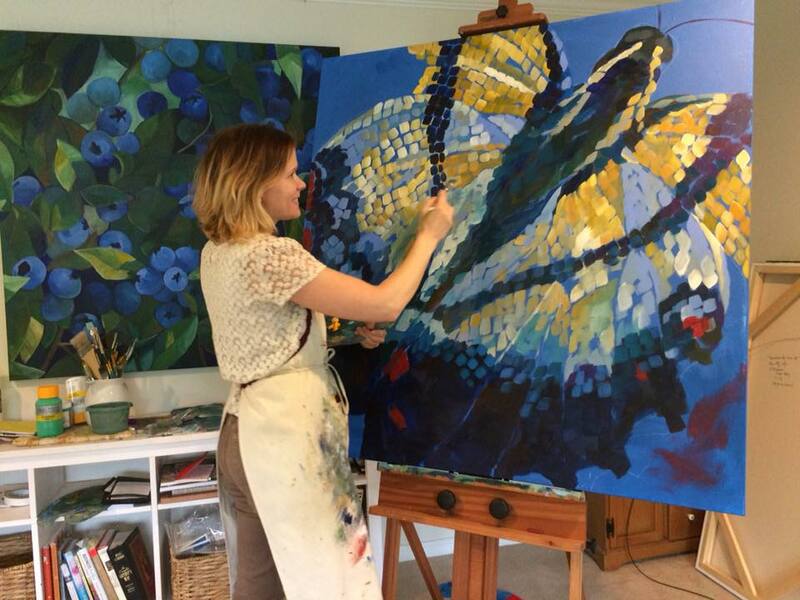 It is stunning to see this painting on the right that I've been working on recently. Revisiting that same canvas size. That same elephant. Curious how I see differently. There is more texture, more color, more patience with myself to spend time in the joy of it. I believe that giving ourselves permission to show up, to do our best, to be new to something, to be more gentle and kind than we previously thought possible. Doing this will change us. I'm so grateful for the way these five years have shaped and changed me. I can't wait to see what the next five years bring. HOORAY! My blueberry collection is ripening! Thursday June 28th is the date (preview for my studio newsletter list is on June 27th) that the collection will be available online. Right now I'm surrounded by blueberry paintings big and small. And I'm considering my ten year old's most recent question, how fast are we spinning? (1000 mph-holy smokes!) I'm grateful for the grounding and presence the creation and experience of art can bring to life. Do you feel like you are spinning through life too fast? Are you overwhelmed? Does summer time mean slowing down? Do you wish summer time meant slowing down? Me too. This blueberry collection is an ode to the longing of the sweet simple joys of summer. And I can't wait to share them with you. Sign up for my studio newsletter for early access. I'm taking a leap and shifting things around in my life. Right now I'm feeling the vulnerability of these changes. As a result of this feeling of vulnerability, I decided to take a break from blueberries to work on a butterfly. Sometimes imagery calls me. Few images speak as powerfully to transformation as the butterfly. The butterfly reminds us to be changed, to let go of old ways of living and thinking, to step into beauty and possibility. And to remember how fragile you are along the way. This is my prayer today as I paint, written for anyone going through times of change. I recently had a chance to share some of my reflections on pieces at the Abington Art Center in a video (below). If you weren't able to make it in person, this gives you a sense of the heart behind some of the pieces. I'll be taking this show down June 6 (sniff!). It was a great deal of fun to display work in such a gorgeous space.